Tank landing ships. 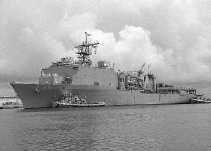 Tank landing ships (LSTs) (fig. 8-29) were developed during World War II. 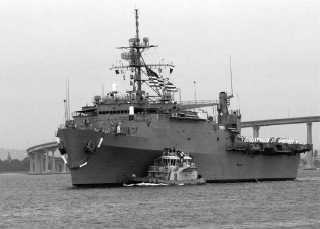 The Navy required a ship capable of transporting troops, tanks, ammunition, and all sorts of supplies. The LSTs of todays fleet are fitted with bow doors and a bow ramp that give access to the tank deck. Another ramp and turntable in the tank deck enable vehicles to turn around and reach the main deck under their own power. They also have a stern gate that permits off-loading of amphibious vehicles directly into the water. In addition to transporting and landing equipment in amphibious assaults, these ships can transport and launch a pontoon causeway section in support of amphibious operations. With booms and winches mounted on the main deck forward, this class of ship is capable of numerous missions. They carry one 20mm Phalanx and two 25mm Mk3 machine guns. Amphibious command ships. Amphibious command ships (LCCs) (fig. 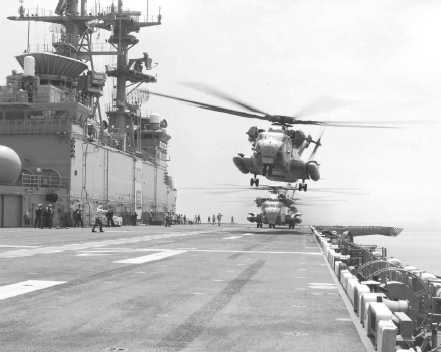 8-30) provide amphibious 8-24 Student Notes: Photograph courtesy of JO2(SW/AW) Tyler A. Swartz Figure 8-25.USS Bonhomme Richard (LHD 6). Photograph courtesy of PH2 Felix Garza Figure 8-26.USS Duluth (LPD 6). Photograph courtesy of PH2 Todd R. Cromer. Figure 8-27.USS Comstock (LSD 45).